There isn’t much the Notre Dame women’s basketball program hasn’t accomplished over the past couple decades, yet it still can’t shake the “underdog” label when it faces Connecticut. Whether it’s an early matchup in December or a game for all the marbles -- like when the two squads meet in Tuesday’s NCAA finals -- the Irish aren’t expected to win. It doesn’t matter that Notre Dame has gotten the best of the Huskies in recent history, winning seven of the past 11 games in the series. Connecticut is the favorite, and Notre Dame head coach Muffet McGraw is just fine with that. All-American guard Jewell Loyd agreed. Playing the underdog is not a position McGraw’s teams have been in very often. The Irish are a fixture in the NCAA Tournament, won a national title in 2001 and have advanced to seven Final Fours, including each of the last five years. Notre Dame has advanced to the NCAA championship game for the fourth time in the past five seasons, and is playing in a title game for the fifth time in program history -- something only three other schools have accomplished (Tennessee 13, Connecticut 10, Louisiana Tech 6). But when you’re facing Geno Auriemma’s Connecticut juggernaut -- winner of nine NCAA titles, including the last two -- you’re bound to be the underdog. And the perennial favorite Auriemma said that’s not such a bad thing. In Notre Dame’s past three title-game opportunities, claiming the national championship trophy has eluded them. McGraw said that while she doesn’t feel pressure from going winless in her last three tries, she wants a victory for this year’s team more than anything. The Huskies seek their third consecutive title. 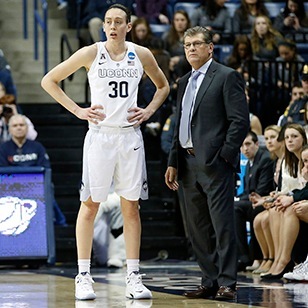 Their coach, Geno Auriemma, seeks his 10th championship, an NCAA record that would tie John Wooden. It's what UConn and Auriemma are the sport's current standard. UConn knocked off Notre Dame in last year’s championship game, and the year before in the semifinals. In 2012, Baylor ended Notre Dame’s run. And the players, well, they will give their all for their coach -- underdog or not and no matter they’re playing.